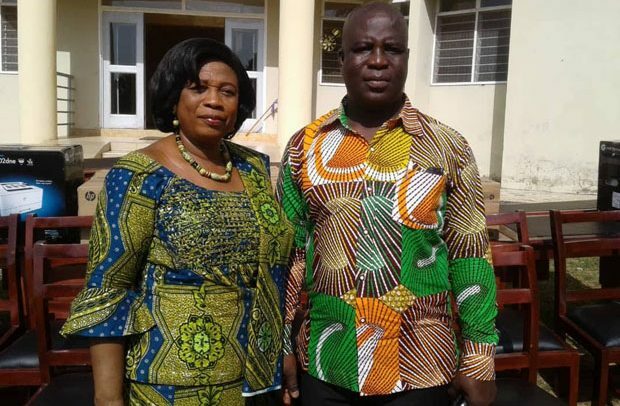 The Education Director for Upper Manya Krobo District in the Eastern Region, Ms Deborah Babatunde, has promised that the chairs and computers donated to her outfit will be used for their intended purpose. The district education office lacks logistics that are needed to aid the effective running of the unit. Former Deputy Eastern Regional Minister and Member of Parliament (MP) for Yilo Krobo constituency, Joseph Tetteh aka Joe Tee, donated 15 chairs, 15 tables, 3 HP printers and 6 desktop computers worth GH¢ 55,000 to the Education Directorate in his constituency. Ms Deborah Babatunde who received the items expressed gratitude to the MP for the kind gesture. She said at first the staff members found it difficult to work because they were not having chairs and computers, adding that as a result they always came to the office with their own laptops. “So these things are going to help them a lot in their day-to-day activities. We are going to make sure nobody uses it for his or her personal business; rather they will be used accordingly,” she stated. On his part, the MP said that because the items they were using in their old office were not working effectively and sometimes delayed their work, it was necessary for the old items to be replaced with new ones in their new office’’. He pleaded with the workers to take good care of the logistics, adding that they were brought to them so that they could support the free SHS programme introduced by the NPP government.